Odd are we have a winner (who is not me). My eye-ball is J-18 region ... not me either. I think that the booster landed near I-20. There will be a winner! Looking for a high angle shot coming back into port, as the rocketcam was on the fritz for touchdown. Definitey to the "upper" side of the circle, looking slightly "left" of center though. Making it look easy when its anything but! Doesn't matter where it is now... it's where it is when it comes back into port, remember? With the octograbber in action, it's unlikely it will move much. Nudge it over to J-22 and I will end you 5 dozen of my daughter's regionally famous sugar cookies. What happens if SpaceX really starts pushing the stage as part of octograbber operations. It would be kinda a downer if every landed stage ends up in the exact same spot (perfectly centered on the barge for safety reasons) every time she sails into port. We wouldn't be able to tell anymore where she landed, there's only 2 options. "Post landing secure position" or "not landed"
of course there'd still be variability in where she touches down, but we would have to change the rules of landing bingo and rely on difficult to conduct analyisis of landing photography. I think it can be done, if the circles are present and we know the fish-eye correction of the camera lens, you can calculate the relative position to the circle center - and from that the square - if at least 3 leg tips are in the image frame. But we better have that program ready by the time SpaceX starts doing this. That would keep the Bingo alive at least until they start landing on the cradle tests. The first time BFS lands on Mars, there won't be any human constructed reference point for Bingo. But I guess we could use photos of craters. I am sure BFR Mars will be very accurate. Enough of this nonsense. It landed on J-20. Where do I turn in my ticket? Electric-drive tracks. Tethered, So plenty of power to run the motors. No need for high speed so it can be geared way down. Motors are probably big enough for slow movement as-is anyways - Some guesstimates had the weight of the thing around as much as the booster itself. Big questions are do the tracks have enough traction and can the extended grabber arms handle the high side loads. Not saying they mean to, But it might be able to. Going to have to hurry to get the winning location... Lifting off barge looks imminent. In a surprising turn of events, the booster appears to have taken off again. With careful analysis of the available photographic images of the B5 booster's return aboard OCISLY a bingo winner has been determined! After allowing a few days for rocketcam video to be released that was lost during the live broadcast (it wasn't) and for some high angle helicopter or drone shots to emerge of the ASDS pulling into port, (none did) still images of the booster landing and a perfect side on shot of the booster standing on deck as it sailed in were used to determine the landing spot. 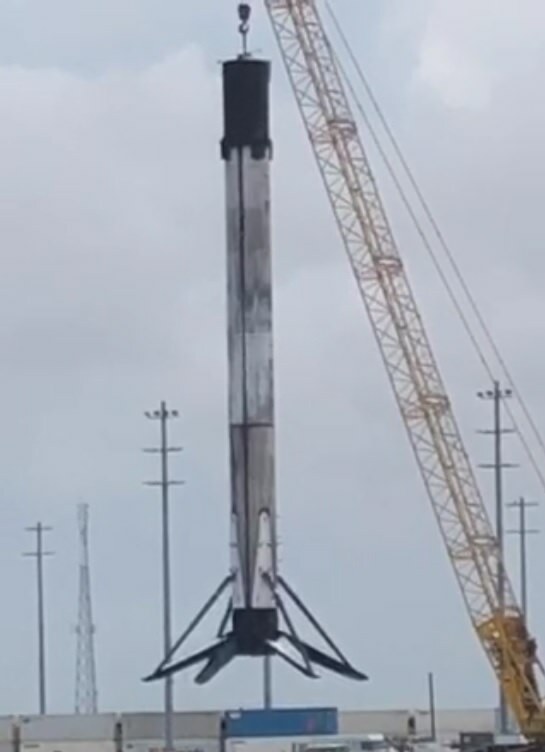 Given that B5s look like they will be offloaded quickly versus spending hours standing on deck and that the OctoGrabber is moved away quickly after crane lift, leaving no indications of where it was holding the booster, this method will likely become standard. Fortunately it seems fairly accurate. So with no further ado, the winning spot was J-20 and the winner is Mark McCombs who picked the winning square 27 minutes after the game went live. Congrats Mark on doing a Banga up job playing! PM me with a mailing address and a prize will be dispatched forthwith! NSF SpaceX ASDS Landing Bingo Will Return. With careful analysis of the available photographic images of the B5 booster's return aboard OCISLY a bongo winner has been determined! Does that mean the Banga Bandhu bingo winner gets a bongo?